If African flavors have escaped your palate thus far, it is time to put an end to the trials and tribulations of missing out on ethnic cuisine. After all, if you have consumed beef pho, at home or abroad, and found it irresistibly amazing, then let adventure run wild and see where it takes you – somewhere along the way you are even bound to end up with an enticing baking dishful of Indian-style lemongrass chicken. This particular recipe calls for chicken pieces. What you do with that is entirely up to you, though we do suggest slow cooking a combination of legs and thighs, with the skin on. While most traditional African chicken stew recipes would call out for peanut butter, 1/2 a cup or more, you can skip that part since it is a non-Paleo ingredient. If you desire a thicker stew, you could add some almond butter or chop up and add a medium size sweet potato instead. And if you want to toss in a little heat, go right ahead with a generous sprinkle of cayenne, or dice up some sliced hot peppers. If you adore this dish and are seeking more African-flavored inspiration, we have one more option in our recipe index just for you: African-style almond and chicken stew. 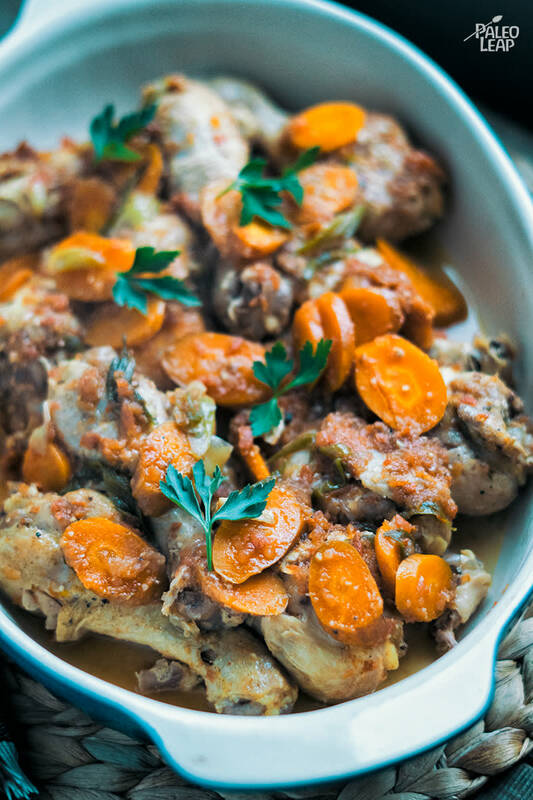 In under an hour you will be diving into a heartwarming bowl of chicken, sweet potato and spices that are sure to please the most curious and explorative eaters. It’s fun scouting out new-to-you international recipes, isn’t it? Melt some cooking fat in a skillet over high heat. Season the chicken pieces to taste. Brown the chicken in the skillet on all sides; about 2 minutes per side. Place the chicken pieces in the slow cooker with the carrots and green onions. In a bowl combine the diced tomatoes, tomato sauce, chicken stock, garlic, cumin, paprika, thyme, and season to taste. Give everything a good stir and pour over the chicken.